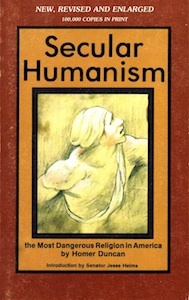 When the U.S. Supreme Court prohibited children from participating in voluntary prayers in public schools, the conclusion was inescapable that the Supreme Court not only violated the right of free exercise of religion for all Americans; it also* established a national religion in the United States – the religion of SECULAR HUMANISM. One cannot read this book without being motivated to carefully investigate the system under which one’s child is being taught and then to seriously contemplate a more vigorous support of the Christian School Movement. Secular Humanism is the greatest threat the church, family or American has ever faced! Yet most Christians don’t ever know it is a fiendishly evil religion that damns not only the soul, but also the present life. Secular Humanism has dethroned God and enshrined man as the centerpiece of life.